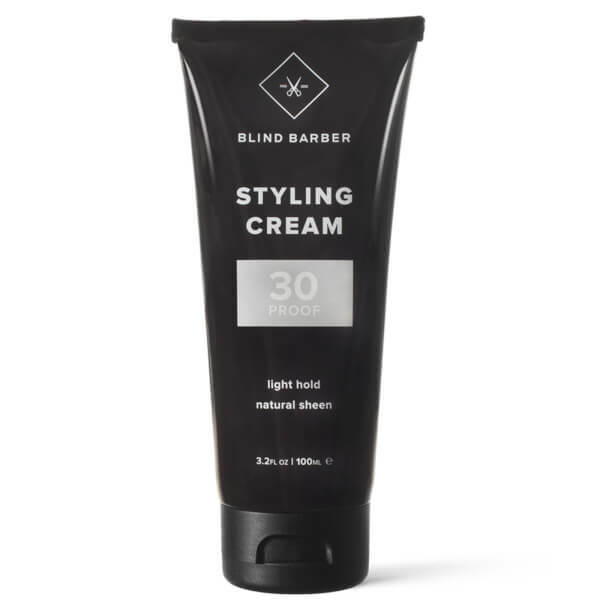 Create your desired look with Blind Barber 30 Proof Styling Cream; a multi-beneficial, water-based formula that provides light, flexible hold. Infused with Hops (from beer! ), the non-greasy cream adds lasting volume, texture and definition, whilst delivering a natural sheen and a subtle Tonka Bean scent. 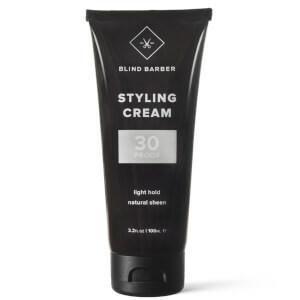 Can be used to style hair, fight frizz or tame unruly beards for a well-groomed appearance. Free from parabens, sulphates and artificial dyes. Emulsify a small amount in your hands and work through towel-dried hair. Water/Aqua/Eau, Cetearyl Alcohol, Steareth-20, Butylene Glycol, Dimethicone, PEG-150 Pentaerythrityl Tetrastearate, Glyceryl Stearate, PEG-100 Stearate, PVP, PPG-5- Ceteth-20, Phenoxyethanol, Guar Hydroxypropyltrimonium Chloride, Propylene Glycol Ceteth-3 Acetate, Fragrance/Parfum, Caprylyl Glycol, Chlorphenesin, Disodium EDTA, PEG-90M, Glycerin, Citric Acid, Humulus Lupulus (Hops) Flower Extract, Linalool, Hexyl Cinnamal, Cinnamyl Alcohol, Butylphenyl Methylpropional, Coumarin, Sodium Hydroxide, Tocopherol, Glycine Soja (Soybean) Oil, Alpha-Isomethyl Ionone, Citronellol, Silica, Limonene, Acetic Acid, Helianthus Annuus (Sunflower) Seed Oil, Sesamum Indicum (Sesame) Seed Oil, Silk Powder/Serica Powder/Poudre de soie.